Two weeks after a migrant trader from Nigeria was shot by Polish police forces, a rising wave of solidarity for victims of racism and police violence is slowly spreading throughout Europe. As investigations about the circumstances of this tragic incident are still ongoing, relatives and sympathisers of the deceased are eagerly trying to mobilise support. With a demonstration in front of the Polish embassy in the Dutch city of The Hague scheduled for this afternoon, the protests against arbitrary police violence and solidarity for the victim, Maxwell Itoya, are reaching a European level. Last Sunday saw the first manifestation commemorating the tragic incident, which occurred two weeks ago. Around 300 people gathered to express their outrage about the shooting of the 36-year-old Nigerian. 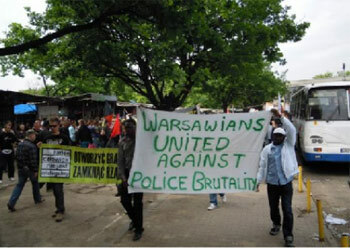 By carrying banners with slogans such as, “Max wasn’t aggressive, he didn’t attack the police, so why isn’t he alive anymore”, or “Stop racism, stop police brutality”, the commonly-shared opinion seemed clear: there is xenophobia and even racism amongst the ranks of the Polish police. However, the exact circumstances under which the husband of a Polish wife and father of three children died are not clear at all. So far, two rivalling versions of the incident prevail, reflecting on the one hand the position presented by the Polish police, defending its integrity and legitimacy. On the other hand, there is the relatives’ and sympathisers’ account, which depicts the tragedy as just another instance of arbitrary violence against foreigners. According to the Polish police department in Warsaw, an accidentally-triggered bullet hit the Nigerian trader in a conflict with the police forces, while they were on a routine patrol on an informal outdoor market in Warsaw’s Praga district. The victim attempted to flee, upon which police officers chased him and tried to handcuff him. An aggressive mob of migrant traders allegedly reacted by attacking the officers, throwing stones and other objects. In this confusion a lethal gunshot was allegedly fired and hit Itoya’s femoral artery. Another version of the story, as represented by the Foreign Ministry of Nigeria and the victim’s family and friends, paints a much less noble picture of the role of the police. Rather than having been an accident, the Ministry labelled the incident as a “wanton killing”, demanding an immediate and full inquiry. For the Nigerian newspaper Daily Independent, the version by the Polish police reflects a rather suitable and media-friendly explanation of a much more sinister truth. Based on evidence by eyewitnesses, the bullet allegedly hit Itoya when he tried to help a colleague, who was being arrested by police forces. This account starkly opposes the former narrative and accuses the Polish police of being xenophobic and brutal. Meanwhile, the public prosecutor’s office has initiated two separate investigations to bring to light what really happened. While one focuses on the question of to what extent the police complied with the law when firing the gun, the other one is to investigate the assaults against the police, allegedly perpetrated by the 32 traders who had been arrested and put in custody. There seems to be evidence that some xenophobic tendencies exist within the Polish police force – be it due to general fears of the foreign other or merely due to intercultural inexperience – and the tragic incident can be seen as an illustration of much wider tendencies in Polish society that affect us all. Migration has become a social fact within the European Union and the success of this model gleams throughout the world, attracting people – wanted or not – to come and make a better living than they might elsewhere. Maxwell Itoya was an immigrant from Nigeria, who worked at the margins of the legal economy to make a better living. As many people in this “niche”, he was associated with being “poor”, “criminal” and thus a “flawed” member of society. Yet, people like him will always be with us, but this in turn will depend on the kind of “us” they are with. oy frickng vey!! racism in poland, who’d thunk lol! !